Show us your profile and your personality. In our Jobsearch area, you will find all the positions that are currently vacant at SICK AG and its German subsidiaries together with current offers of internship semesters, thesis work, working student opportunities and our SensorING entry-level program. We are looking forward to receiving your online application. Thank you. We wish you every success! Search, find, apply – best of all straight away. After looking at our Jobsearch area, have you found an offer that interests you and whose profile corresponds to you? Then apply online. In our Jobsearch area, you will find a direct link from the relevant job offer to the application form. Or are you interested in working for our company even though there is not currently any suitable position available in our Jobsearch area? Although we post all unfilled positions there, the situation can change suddenly at any time. That is why we would like to receive an online unsolicited application from you. You will find several possibilities for unsolicited applications separately per company and functional area whithin our jobsearch area. Please open the search field „Functional area“ and choose the option “Unsolicited application“. And what is more: We do not have any deadline for applications because we carry on searching until we have found the right person for the job. As soon as a position has been filled, we remove it from the Jobsearch area. 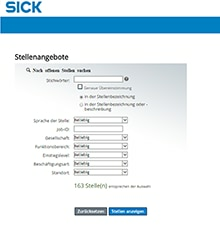 SICK AG is network partner for filling vacant positions at the University Medical Center Freiburg. If you are interested in job offers in this area: Take advantage of this partnership.